Oh man, we have a race on out here! 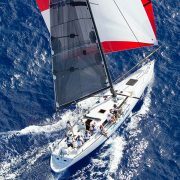 We are one week into the 2017 Transpac aboard J/World’s Hula Girl, and this is fantastic sailing. Our fleet is phenomenally tight as pass the 75% mark. Consider this: we were in fourth place a couple days ago. We got some fishing net stuck on the keel which we dragged a while before we could drop the spinnaker and ‘back down’ to get it off. That was Monday morning. Then Monday night we got an unknown something stuck on the keel and had to repeat the process. Come next standings update, we had fallen to 7th. Ouch. Newly motivated to redeem ourselves, we busted our humps and, what do you know, next roll call we were in 4th again. Then after another couple days of hard work, we were excited to see that as of roll call this morning, we had climbed into third place. But it is super close. With Horizon a bit punched out, there are about 5 boats seriously in contention for second place. This is some seriously fun stuff and close racing! Just before sunset yesterday we jibed towards the south. It’s a bit early to make that move as usually in the Transpac you want to hold off on the turn south until you are pretty far West, almost to the layline for Hawaii. But this year there will be some general lightening across the course and all the weather models are showing a left shift in a couple days, at which point we will want to jibe back to starboard tack. It’s a bit nerve wracking to be separating from most of our fleet, but in analyzing and (re-analyzing) all the data, it really looks like the right thing to do. And as of this morning, we have a number of boats coming our way. So here goes nothing! Yesterday we dried out some of the sails and jibs used earlier in the race, refolded them and packed them down below. We had some nice sunshine and beautiful sailing, and it looks like more of the same on tap for today. Most of the crew took showers (woo-hoo!). Last night we had chef’s select sashimi grade Ahi, lightly seared, crusted with sesame seeds and prepared with a dijon mustard laced ponzu sauce. The fish was served with garden greens tossed in a raspberry vinaigrette, and paired with a crisp dry Napa Chardonay. Just kidding. We had freeze dried. Early this morning we had our first tropical squall. It was a pretty weak one, but brought a little bit of rain. Nice. We saw a cruise ship a couple days ago, a few birds, a good number of flying fish, and sadly more trash. Other than that, we could be led to believe that we are pretty much alone out here. 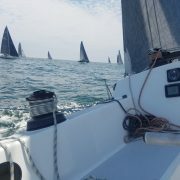 But we know that there are a whole lot of boats racing, and we will probably start to bunch up in the bottleneck towards the finish, so maybe we’ll see more of our fleet in the next couple days. Everyone is doing great…. driving has been super solid, and I have been really impressed with everyone’s level of engagement: there is no cleat-it-and-forget-it mindset here. The trimming and grinding has been top shelf and the whole team has earned my admiration! It’s about 8am local time here. “Easy D” (Derek) is driving, Jimmy ‘Peterbilt’ is trimming, Andreas grinding, and Patrick is trying to untangle the spinnaker net. Argh. Ok, that’s it for now… more soon… stay tuned for what could be an exciting finish! 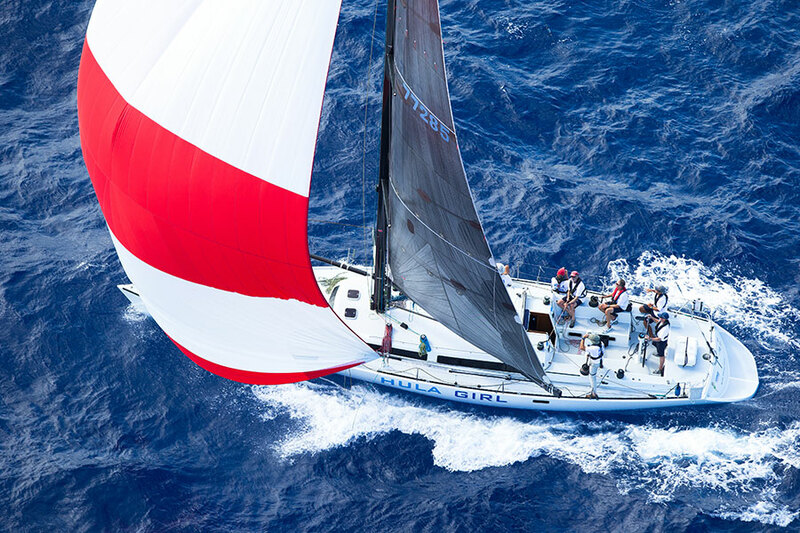 http://sailing-jworld.com/wp-content/uploads/2015/01/2015Transpac_finish_72815_sg_046193.jpg 600 900 jworld http://sailing-jworld.com/jworldwp/wp-content/uploads/2015/01/Header-Logo.gif jworld2017-07-12 23:58:372017-07-12 23:58:37TRANSPAC 2017 - Third Report - Race On!! 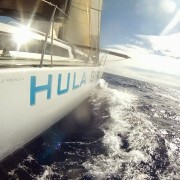 TRANSPAC 2017 - HULA GIRL IS UNDERWAY!